Although off to a warm start, The Farmer’s Almanac is predicting another cold winter this year, including possible icy conditions in late January. You don’t want to be caught on a cold, icy night with no heat. This is why early detection is so important. Annual maintenance can identify potential heating repairs earlier, saving you money and preventing you from spending a night shivering under the blankets with no heat. Maintaining your heating unit is similar to maintaining a car. Any mechanic will tell you that the most important maintenance task for cars is changing the oil on a regular basis. Simple, yet effective for maintaining all the working components of an engine. If a car owner fails to have the oil changed, then the engine parts are not lubricated adequately and they begin to fail. Annual heating maintenance ensures that all the heater components are working properly, parts are well lubricated, and belts are changed, if needed. Quite often, the service technician can spot issues early preventing major breakdowns on those cold, wintry nights. The burning process for gas and oil produces carbon monoxide. Since your heating system burns these elements to produce warm air, a small amount of carbon monoxide is normal. The ventilation system is designed to eliminate this small amount of carbon monoxide by filtering it out of the home. However, a crack in the ventilation system or a dirty furnace can allow this poisonous gas to leak into your home. Carbon monoxide is odorless and can be extremely dangerous, and can cause death. Most homes today are super-insulated. This is great for reducing your energy costs because it keeps the cold air out and the hot air in. However, creating an airtight environment also creates an ideal environment for carbon monoxide buildup. By having your furnace checked and repaired promptly, you and your family are protected from this silent but extremely dangerous gas. The simplified recipe for creating warm air is easy: fuel, air and fire to generate the burn. In order to operate efficiently, the proper mixture of all these ingredients (air, oil, or gas) must be monitored. 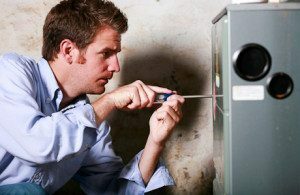 When a technician comes out to check your heating unit, this mixture is checked to ensure that the burn is efficient plus he checks the burners to ensure proper ignition and burner flame. Additionally, the technician checks to make sure there are no leaks or blockage in the ventilation system and to make sure that the wiring is not corroded or damaged. By simply performing an annual check-up, you can minimize your heating repair costs and protect your and your family from the harmful effects of a leaky ventilation system. Don’t delay in having your heating repair in Greensboro completed today, call Berico Heating and Air Conditioning at (336) 496-2509 to schedule a check-up before the cold weather arrives.